The site is provided only in English language. OpenScape Business offers SMB enterprises the answer to their demands in one solution, providing the easy way from Voice to UCC, from hybrid TDM to full IP, incl. Web Collaboration, voice and fax message boxes, notification service, mobility, a Multimedia Contact Center and presence status functions. As standalone system up to 500 subscribers and in networked systems up to 1000 subscribers can be connected. Different models are available for the use of telephony and UC functionality. OpenScape Business X3, X5 or X8 are "All-In-One" HW platforms with onboard IP access and support for up to 500 subscribers with IP, digital (UP0E), ISDN (BRI), analog (a/b), cordless (DECT) devices. UC Smart application is fully embedded. Connection to public WAN is done via SIP (LAN), ISDN (BRI und PRI) or analog trunks. OpenScape Business UC Booster Server is required for OpenScape Business X3/X5/X8 in case of of more than 150 UC users. The UC Booster Server is based on Linux (Novell SLES) and can be operated either on a server HW directly or in vitualized environment using VMware vSphere. OpenScape Business S is the server-based "All-In-One" telefony and UC platform, which supports up to 500 IP subscribers and IP (SIP) connection to the public network (WAN). It is designed for Linux (Novell SLES) operating system and can be operated either on a physical or on virtual machines with VMware vSphere. OpenScape Business S can be networked with OpenScape Business X3, X5 or X8 as gateway for ISDN or anlog trunks or TDM / analog devices. Digital Phones 24 56 384 n.a. Remarks: Figures are subject to change. For actual figures refer to the latest version of the Sales Information and the datasheet of OpenScape Business. OpenScape Business combines the best of the HiPath 3000 and OpenScape Office in a unified software solution architecture based on modern and innovative communication technologies. System box and almost all existing devices can be reused only the motherboard and the SW has to be replaced. For detailled feature descriptions have a look into the OpenScape Busisness datasheet or feature description Documentation. Call Signaling, Calling Line ID: CLIP, CLIR, COLP und COLR. UCD (Uniform Call Distribution): Uniform distribution of incoming calls to a group of subscribers (UCD group). SIP phones with RFC 3725 support. Older devices (such as optiPoint 410/420/500, Gigaset SL3/S3/M2 and optiPoint WL2 SIP only) are supported. For further details such as the required SW versions for each device, please refer to the respective technical release notes. Optiset E devices cannot be operated. UC Smart SW is fully embedded within the OpenScape Business SW running on the motherboard of OpenScape Business X3/X5 and X8. It comprises the Unified Communications and Collaborations features of the HiPath 3000 WebServices. 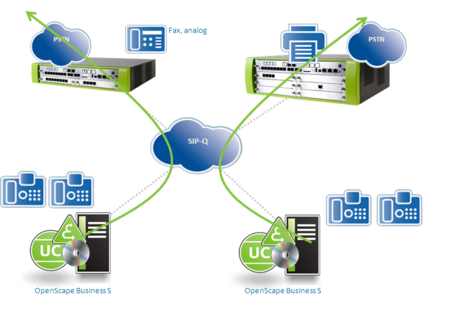 UC Suite provides the Unified Communications and Collaborations solution known from OpenScape Office LX/MX/HX. UC suite comprises extensive functions for such as presence management (Presence status), drag and drop conferencing, visual voicemail (Voicemail), multichannel contact center, IM (Instant Messaging IM), Mobility, directory access with database connection, fax, integration into Business processes and the connection of OpenScape Web Collaboration. Operation of UC Suite requires the "UC Booster Card", which is plugged on the motherbord of OpenScape Business. As an alternative, in case of extended number of Unified Communications users, an external "UC Booster Server" has to be connected to Open Scape Business. all of the functionality in myPortal for Desktop available as an MS Outlook toolbar! myReports provides over 100 predefined standard reports. The historical reports are provided as graphs and/or table views. OpenScape Business provides some embedded applications, which are running optionally within the OpenScape Business system. OpenStage Gate View is a user-friendly, security solution that offers real-time video surveillance to observe, control and grant access to entrance areas all from your OpenStage Business phone, PC or your Smart Phone. IP-capable video cameras send video streams to the OpenScape Business, which enables authorized Gate View users to display this video streams. The video image associated with an activated entrance telephone (door opener) can be automatically displayed on an assigned OpenStage phone. In addition the video can also be displayed on mobile devices by using the web client or in case of Apple´s iPhone using the appropriate App. OpenStage GateView supports also scheduled recording of a video stream and the saving of recordings to a network drive. Administration of Gate View is done via the administration portal of OpenScape Business. As a prerequisite a UC Booster Card or OC Booster Server is required for OpenScape Buisness. Capacities of Gatev View in terms of number supported cameras and phones etc. depends on the choosen UC Booster HW. Details are decribed within the administartion manual. The use of Gate View is licensed controlled. An OpenScape Business network is controlled by the so called Master Node, which does not require necessarily additional HW/SW depending on the size of the network. An administrator can access all network subscribers via the Single Point of Administration within the Master Node. When changes are made within the Master Node administration, the databases of the individual network nodes are automatically synchronized. A LAN/WAN based IP network is required as prerequisite for networking. OpenScape Business systems can be networked with one another also via digital trunks. Both S0 as well as S2M lines with QSIG protocol can be used for the connection. Within the following some essentiall networking scenarios are shown. Details, prerequisites and even more scenarios are decribed within the administration manual of OpenScape Business Documentation. 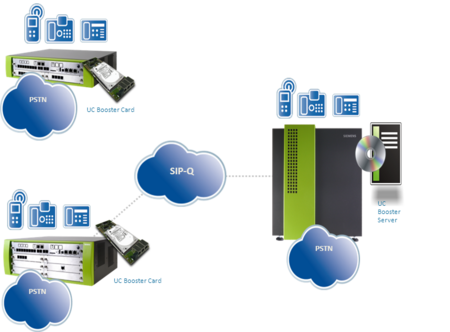 Up to 32 OpenScape Business communication systems can be networked with each other. Up to 32 OpenScape Business X3/X5/X8/S communication systems can be networked with one another. 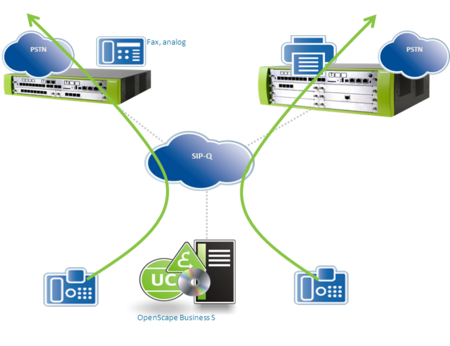 Multiple OpenScape Business S systems are allowed in an internetwork. Single Gateway means that all IP stations registered at OpenScape Business S only use ONE gateway to the PSTN. Up to 32 OpenScape Business X3,X5,X8,S communication systems can be networked with one another. Multi-gateway means that every IP station registered at OpenScape Business S is assigned to exactly one specific gateway. OpenScaoe Busness supports many interfaces, protocols and standards for integration into business process or connection to 3rd party applications. Details are listed in the the datasheet or feature description. Within the following section only the most relevant interfaces and integrations are described. Nearly all connections, except TDM telefony, uses the Ethernet LAN interface of OpenScape Business. Many CTI and CRM applications on the market use the Microsoft TAPI interface for connecting to the telephone system. With OpenScape Business TAPI 120 V1 and OpenScape Business TAPI 170 V1, two new and powerful TAPI Service Providers (TSP), which are optimized for the system architecture and network topology of OpenScape Business, are now available for connecting TAPI-based applications in addition to the CallBridge Collection. The choice of the appropriate TAPI Service Provider essentially depends on the number of client PCs to be connected with TAPI applications as well as the existing IT infrastructure and the phone devices used. is used as the preferred first-party TAPI Service Provider in Microsoft networks with or without a domain controller when analog, Cordless and system devices without IP/USB interfaces are also to be operated in conjunction with TAPI applications. The TAPI 120 Service Provider is installed on each PC client that is running a TAPI application. Connections via TAPI 120 are subject to licensing within OpenScape Business. To connect to OpenScape Business, only one CSTA link is required, regardless of how many TAPI 120 clients are being operated. is a classic "third-party" TAPI Service Provider that is installed on a server on the LAN and connected centrally to the OpenScape Business System. TAPI 170 can be used as an alternative to TAPI 120 if there is a domain controller in the Microsoft network. When using the so-called remote TAPI function, it is not necessary to install the TAPI Service Provider on the client PCs. This offers significant time savings in installations with many client PCs. Connection of TAPI stations in networked OpenScape Business systems when the TAPI stations are located in different nodes. OpenScape Business TAPI 170 is subject to licensing within OpenScape Business. To connect to OpenScape Business, one CSTA link is required, regardless of how many TAPI 170 stations are being operated. Administration of OpenScaoe Business is done mainly via Web Based Management (OpenScape Business Assistant). Manager E tool, known from HiPath 3000, can also be used for administration alternatively. Documentation is available from different sources depending on the type of documentation. Main source for technical documentation and user guides is the OpenScape Business systems itself. Documents are available either as download from the system SW via the administration tool or can be accessed direcly as file on the SW storage media. All available documents can be obtained via Siemens Enterprise Business Area Portal Partner Portal. The following table gives an overview about the provided documents. Use of OpenScaoe Business features is licensed. Starting with the basic system licence, additional features can be easily added, by importing appropriate license keys. License keys are providedby the Central License Server order dependent and are managed by the administration tools of OpenScape Buisness. OpenScape Business supports a Licence Activation Period with full feature functionality for a time period of 30 days after first installation. After 30 days system functionality is restricted to emergency operation in case that no valid license keys have been uploaded to the system. If specific functions should be tested for a time period of 90 days, so called Evaluation Licenses can be ordered. OpenScape Business offers an easy migration path from HiPath 3000 to OpenScape Business. Depending on the HW / SW version of HiPath 3000 existing housing, power supply and also many peripherial boards and devices can be reused. Within many migration cases only the mainboard, System SW and license file need to be replaced by OpenScape Business components. Conversion of system configuration data is also supported. Partner Portal Web portal (login required).